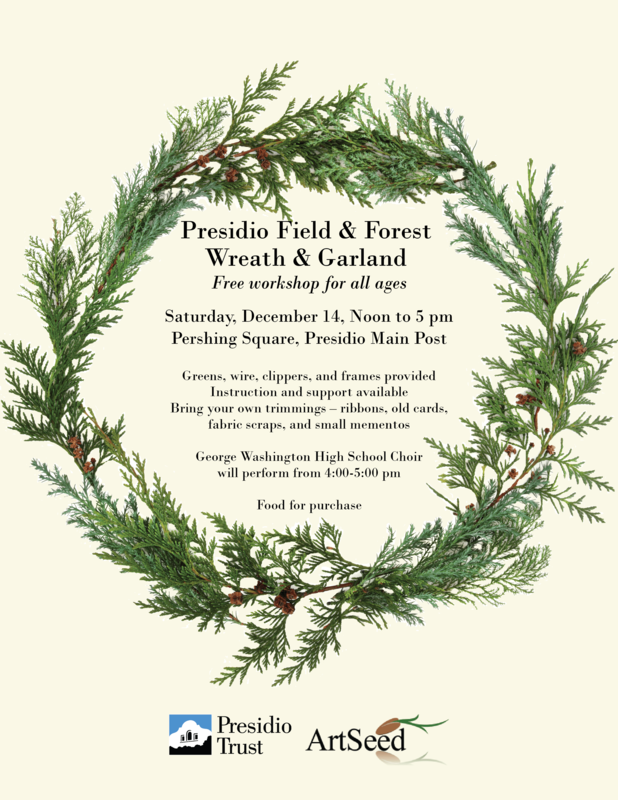 Wreath Making at the Presidio! Saturday, December 14, Noon – 5:00 p.m.
Join us for this free all-ages event and learn how to make a unique “field and forest” wreath made entirely from natural materials collected from around the Presidio with ArtSeed artists! Organic materials will be provided at no charge, however, we encourage participants to bring along their own embellishments such as ribbons, old cards, fabric scraps, and small mementos to make your wreath a one-of-a-kind piece of art! The event will be held at Pershing Square (near the Officers’ Club) on the Main Post. Saturday, December 14, Noon – 5:00 p.m. Food will be available for purchase.